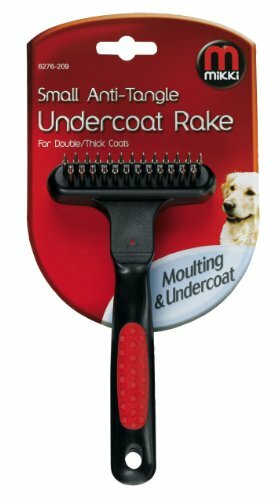 Mikki Anti-Tangle Undercoat Rake for Double Thick Coats Size Small takes the otherwise daunting task of grooming your pet's thick, tangled coat and makes it stress-free for bother?pet and owner. This specially designed tool moves with the shape of?the body whilst grooming, ensuring maximum comfort whilst working through knots and matted areas. The clever design of this anti-tangle rake removes the tangled undercoat, leaving a soft, tangle free top coat, whilst the ergonomically designed handle allows for a comfortable hold. ?A clever tool for easy grooming! Ergonomically designed soft grip hangle which allows for comfort and control whilst brushing your dog. If you have any questions about this product by Mikki, contact us by completing and submitting the form below. If you are looking for a specif part number, please include it with your message.